What are the Groom’s Ceremony Duties? 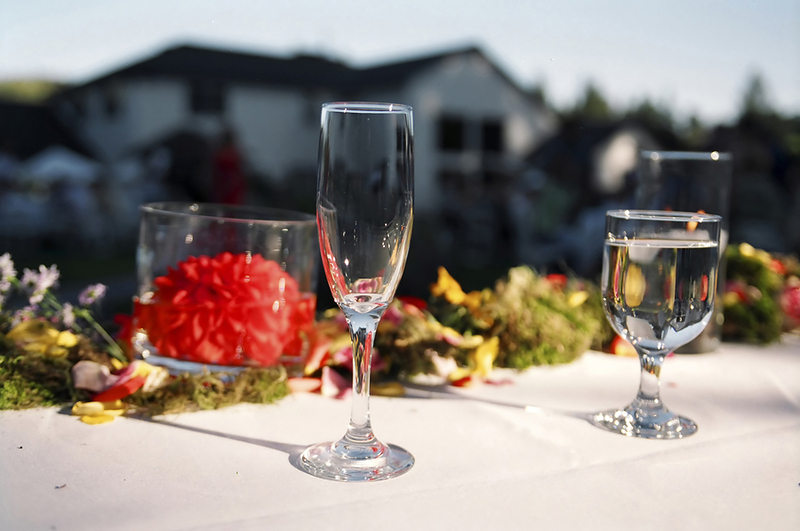 While much of the groom’s wedding planning attention is focused on the rehearsal dinner and honeymoon, he’ll also have a hand in several aspects of the marriage ceremony itself. The bride’s family does historically cover the majority of wedding day costs, however there are several ceremony-related expenses and responsibilities that the groom, his parents or a combination of both are traditionally expected to provide. One of the groom’s traditional responsibilities is paying for the bride’s bouquet that she’ll carry down the aisle. Some guys will roll their eyes at this, but it’s actually a key ingredient to the bride’s overall look. Take it from a married man: You’ll never forget how you feel when you see her walking toward you, flowers in hand, ready to become your wife. The groom is responsible for selecting the tuxedoes or suits that he and the wedding party will wear during the ceremony. He’ll need to coordinate local fittings and provide instructions to out-of-towners. It’s also a nice touch to cover any rental fees for both the groom’s own father and the father of the bride. The law states that you must secure a marriage license before you can get married. Tradition states that the groom is the lucky one who gets to pay for it. Before you head down to the courthouse, be sure to check your state’s laws associated with marriage licenses. 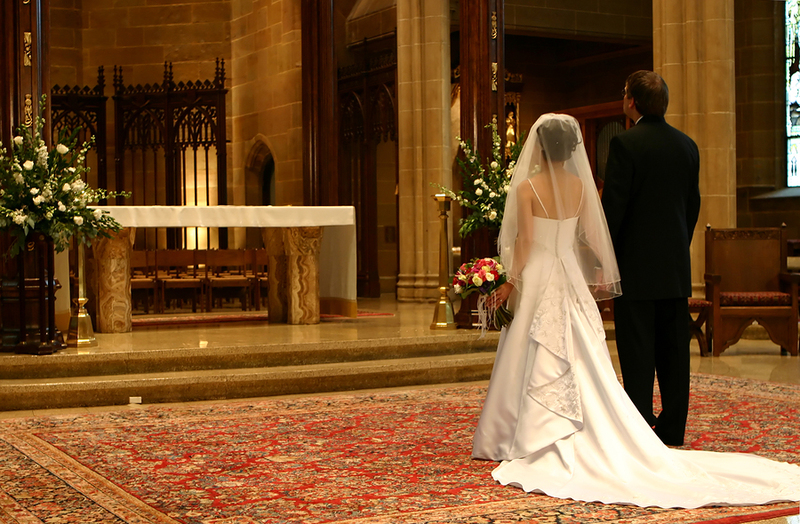 If you’re getting married in a church, the groom will also be expected to pay for the clergy fee and/or cash tip. Arranging transportation to and from the ceremony also falls under the groom’s duties. Popular options include trolley cars, stretch limousines/SUVs and classic cars. This is truly an area for the groom to get creative. Last but not least is something money can’t, or rather shouldn’t, buy: the wedding vows. If the bride and groom decide to pen original vows, it’s a good idea to get started writing them no later than two months before the wedding. If you’re selecting from a list of vows, review it carefully and choose the ones that most closely represent your feelings. How will you be involved with the ceremony planning? Will you follow the duties listed above or will you be changing things up from tradition? Tell us in the comment section below. Is Wedding Officiant Becoming a DIY Role? As more and more people move away from religious weddings, the idea of asking a friend or family member to officiate at the wedding has become more and more popular. There are some pros and cons to hiring a friend for this important role. Pro: You have more control over the ceremony. Con: You have more control over the ceremony, meaning you have to write it yourself. All of it. Pro: Your friend is a friend, no chance he’ll mispronounce your name, or include a religious sentiment you fine offensive. Con: Your friend is a friend, meaning he isn’t an objective professional. Really, is he going to tell your fiancée that having three readings, a sand ceremony, and a unity candle is too much? Pro: No unwanted, unsolicited advice about your relationship. Con: Um, actually this is pretty much just a pro. Unless of course, you think you could use some help in this area, in which case, no reason not to consider couples counseling. If you do decide to ask a friend to perform your wedding, make sure to choose wisely. Choose someone who is comfortable with public speaking, knows how to ad-lib when necessary, and takes direction well. 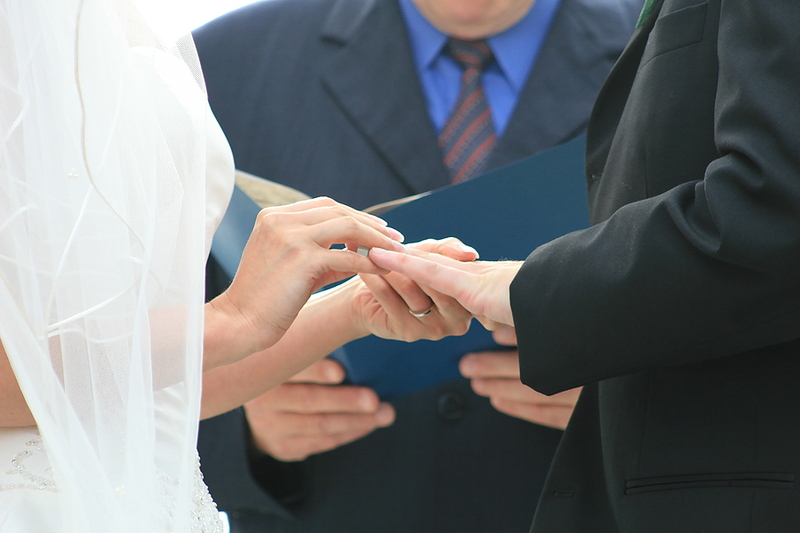 Are you considering using a friend or family member as officiant? Wedding officiants: how do you feel about this trend? Let us know in the comments section below. As part of her virtual ‘Before You Tie the Knot’ book tour, our friend Rev. Angela Butts Chester stops by today to answer our questions on grooms, ceremonies and healthy marriages. Enjoy..
Q) What is the top wedding fear or concern that grooms have when you first meet or talk to a recently engaged couple? How are those fears different than those of the bride? A) The top wedding fear for the groom can be different than that of the bride. His fear and concerns are usually different depending on his role in the wedding. There are two couples: those who pay themselves and those whose parents pay for the wedding. If the parents are paying for the wedding, the bride & groom are as different as night and day. The groom wants to make sure he doesn’t do anything “stupid” or look bad in front of his soon to be in-laws. The bride wants to make sure that the ceremony is as romantic and elegant as she has always dreamed. They usually do not mention words like cost, but will refer to the price of something. Subtle difference, but important. If the wedding couple is paying for the ceremony themselves, they agree on one thing up front – the cost! He will state, “We are paying for this ourselves, so we want to keep the cost low” several times in the conversation and consultation. This is to remind not only me, but his bride, not to select a package that is too pricey. His worry is that they will become over extended. Her worry is, she wants a nice ceremony, but doesn’t want to appear to have been thrifty, while still staying on target. If the couple is seeking premarital counseling, the other concerns about marriage are discussed. If they cannot get to a counselor, purchasing my book, Before You Tie The Knot, can help. The book goes over the many topics that cause problems within a marriage; topics couples get divorced over. From relationship expectations to children, we’ve covered it all. Q) How can grooms and brides work together in the early stages of marriage to ensure that their marriage is successful? Can problems that arise during wedding planning eventually affect the health of the marriage? A) Marriage is teamwork; you need to work as a couple towards your goals. If you are not mindful of your spouse, not only will planning your wedding be hard, but your married life will suffer at some point. Working together is key. You can start with wedding planning. Brides have a tendency to want to do it all themselves. Get your fiancé involved. Give him tasks that he will enjoy doing, that you need done. Put him in charge of creating the maps to the wedding reception or getting items on a list to the proper venue. If he has an eye for art, select the invitations together and so on. When you purchase Before You Tie The Knot – A Premarital Counseling Workbook for the DIY Couple, you will find out about your partners wishes, expectations and needs; their strengths, weaknesses, fears and outlook. This is powerful information. Some people don’t talk about what they need; they leave the other to assume. Married roles are changing. It’s not the cookie cutter roles of the 50’s. You need a foundation as to what your life will be. If the groom does not wish to participate in planning the wedding, it doesn’t mean that he is a bad person or that he will be a slacker later in your married life. You should, however, have concern if he has no plan for his life at all. With Before You Tie The Knot – A Premarital Counseling Workbook for the DIY Couple, you discuss housekeeping, social life, religion/beliefs, finances, parenting/children, just to name a few. Decide what you want in the beginning and work from there. Adjust as you go along and work as a team. Q) Do you have any funny ceremony stories that you can share with our readers? A) I married an interfaith couple – she is Christian and he is Jewish. Neither of them wanted to convert to the other’s religion, but respected the other’s belief system. So, at the very end of the ceremony, both families decided to do a very cute gesture. The couple was pronounced husband and wife, they kissed, turned to be presented to their friends and families and that’s when the father of the bride, takes a glass wrapped in a white cloth, breaks the glass with a hearty stomp – Mazal tov! The groom’s side laughs. The groom’s side then stands and says – Amen. As the new couple and wedding party recess, there are cheers, applause and waves. This was a great way to respect the other family and put everyone at easy. It was a great wedding. OneWed’s Local Flavor: Time to Face the Crowd? Turn around and let us see those beautiful mugs. In a traditional wedding ceremony the bride and groom face the officiant and their guests face… the backside of the bride and groom. A recent trend in weddings is for the bride and groom to mix it up a little. 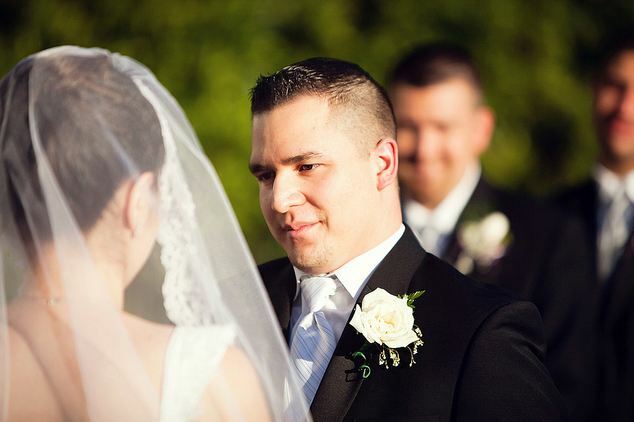 One popular idea has the bride and groom facing each other, so that they can see both the officiant and their guests with their peripheral vision. Another idea is to have the officiant stand with his or her back to the crowd so that the bride and groom are facing both the officiant AND the guests. 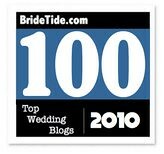 Some people think this trend is a great idea that allows couples to really include their guests in the ceremony. Others think that it’s well, a little showy and narcissistic. After all, this isn’t a play it’s a wedding. Before deciding to face your guests, make sure to consider a few things. 1. If you catch the eye of your freshman-year roommate during your vows will he make a crude gesture that causes you to dissolve into laughter? 2. 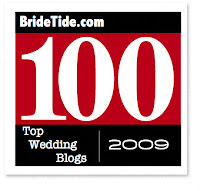 Are you or your bride shy or have stage fright? 3. What does the officiant think? Simon Daykin says to keep those wedding day surprises coming! Here’s a story about a wedding I did last year. This wedding took place at the Rimrock Hotel in Banff. (On a side note, the service, food and hotel staff were AMAZING. I can’t say enough great things about them) When we sat down to design this wedding, I wanted to keep the guests guessing and the surprises coming all night. So we took each element, the ceremony, the cocktail hour, the dinner and the party and treated it as its own event, and each event was revealed to the guests as the night progressed. This kept the element of surprise to a maximum and it kept them guessing what would happen next. The ceremony was held in one of the longest rooms I have ever stood in. I mean it must have been a good 65 feet or more. It was funny listening to the bridesmaids comment on how long their aisle walk was. The room had full windows behind the couple with a full view of the mountains. I had the hotel remove the curtains and sheers so the view was totally unobstructed. We also didn’t use too much décor in this room because with views like that, you really don’t need to. We did add some candles and flower arrangements to the aisle. We brought in a faux fireplace, which we filled with candles (battery operated) we also placed close to 200 additional candles on the fireplace, the window sills and some on the frames. These were all real and gave the room a fantastic glow. It was simple, romantic and classically elegant. The cocktail hour was held in the room between the ceremony and the dinner area. We had to transport the chairs from the ceremony to the dinner and I didn’t want to interrupt the cocktail hour while doing so, we also had brought in winter trees that had glass ornaments on them that were the place cards but we didn’t want those unveiled until later. We set up pipe and drape curtains as a fake wall to hide the chair movement and we placed the trees behind the drape as well. Half an hour before dinner, we took down the draping , revealed the trees and asked everyone to find their place cards and please take their seats for dinner. The place cards were attached to the glass ornaments and strung alphabetically. We also rented a vintage photo booth to put a spin on the guest book tradition. Guests popped into the booth, took the 4 pictures, then they could drop them off in a vase for the couple or keep them, it didn’t matter, they were free so you could take as many as you wanted. It was the highlight of the cocktail hour along with the beautiful ice martini luge which had snowflakes etched into it. We took the dinner space and utilized the dividing walls of the ballroom. In short, we kept one area closed. The guests were seated and dinner and speeches ensued. There was a great window view of the mountains, and the hotel had lit the trees outside as well. So we brought in our own trees (which I build onsite) to bring the outside in. We also changed up the head table a little so it was easy for the wedding party and the guests to talk to each other. I am so bored with the long head table…another tradition I feel needs to go away, so we made it an open rectangle. For the lighting we used a purple gel to compliment the wedding color and create a wonderfully romantic atmosphere. The centerpieces also used branches to continue the outside theme and we lit them with miniature LED lights for a wonderful glow at each table. When the speeches were completed and dessert had been served. We had the MC announce that the bride and groom would now be leaving. With no explanation to the crowd, the Bride & Groom got up and left the room. This really got the room buzzing. There was no DJ or band set up in the dining area, there wasn’t even a dance floor. Well, as the wall divider was pulled back, the 13 piece band started up and the couple was already out on the dance floor. Everyone turned to see the ultra lounge we had created and kept hidden until now. It was party time and this was the place to party. The band was set up on the stage, there was an additional bar with tall cocktail tables, a huge dance floor, and across the dance floor was my lounge. We brought in modern, white leather furniture and created a lounge area to relax and chat when the guests weren’t dancing. We also had glass top coffee tables and white leather benches to increase the conversation area. This was also lit in the purple hue so it remained in step with the color theme of the wedding. Take your wedding day and break it into mini events. You want your guests to be talking about your wedding for years to come and to compare every other wedding they go to, to yours. You want to keep them guessing and you want them to be surprised. So treat each part of the day as if it were its own event. Weddings can become boring and predictable, I hate those weddings, and I see no reason why you should settle for one of “those” weddings. Make sure you have a theme that carries throughout the entire day. This can be a color palette or in our case, bringing the outside in as we did by highlighting the outside view, placing winter trees in the cocktail area, and strategically placing trees in the dining area and the lounge. Make sure you have something to tie your mini events together or it can get really messy and the atmosphere and ambiance can get lost…and you don’t want that. I like to keep the guests guessing, don’t lay it all out for them. Keep a few tricks up your sleeve to WOW them later in the night. No one likes predictable, I know I hate it. So if you have some details hidden away to be revealed at a later time, it will create a buzz in the room, and have people talking about your wedding for years to come. Simon Daykin is an award winning event designer, planner and groom stylist with Fire Fly Occasions. Simon strives to get grooms involved in the wedding planning process and have their opinions heard. He understands that grooms can get left out or pushed out of the planning process so he’s here to help. You can connect with him further on Google+.